Hans Lippershey is often credited with inventing the telescope because he was the first to file paperwork on the device. It remains unknown, however, whether Lippershey was a creative inventor with an original idea or only a craftsman with an appetite for entrepreneurship. Very little is known of Hans Lippershey's early life. Even the spelling of his name is in dispute: his first name is sometimes spelled Jan, and his last name is sometimes spelled Lippersheim, Lipperhey, or Lippershay. Lippershey was baptized in 1570 in Wesel, a town in what is now Germany. Sometime before 1594, he moved to the town of Middelburg, the United Provinces, which is now southwest Holland. In 1594, Lippershey was married, and six years later he officially became a citizen of the United Provinces. As far as historians have been able to determine, he lived the rest of his life in Middelburg, making and selling spectacles out of a shop he owned. Spectacles required transparent lenses, but the manufacture of highquality lenses had long been a challenge. Sometimes rounded pieces of crystal were made into lenses, but crystal clear enough to see through was rare. Early methods of manufacturing glass, whether for windows or lenses, left it cloudy or ridden with bubbles. In the mid-1300s Italian glassmakers developed methods to produce clearer, better-quality glass. Not long after, spectacles came into use. The only lenses made, however, were convex (curved outward), which helped only people who were farsighted. In the 1450s, concave lenses, which curve inward, were developed to help the nearsighted. The first telescope was made by combining a convex and a concave lens. How Lippershey hit upon this idea is unknown, and the genesis of the concept would later become a point of contention among historians. One popular legend maintained that a boy-Lippershey's son in some versions, his apprentice in others-was playing with the lenses. The boy held a convex lens far away in one hand, while holding a concave lens close to his eye in the other hand, so that he was looking through both simultaneously. Suddenly, a distant church tower loomed in the lens before the boy, startling him mightily and causing him to run off to report the interesting effect to Lippershey. 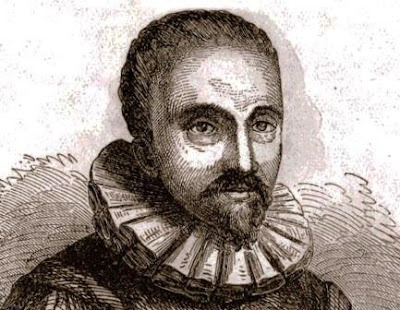 In the 1630s another account of Lippershey's inspiration came to light, when a spectacle maker named Zacharias Jansen charged that Lippershey stole the idea from Jansen's father, Hans, who Jansen claimed had created the telescope in 1604. Historians, however, tend to dismiss Jansen's account because he was a forger who was often in trouble with the law. In 1608, Lippershey took a concave and a convex lens and enclosed them in the opposite ends of a metal tube, creating a telescope. He then decided to obtain a patent on the device. To apply for a patent Lippershey had to travel to The Hague, the capital of the United Provinces. At an interview on October 2, 1608, Lippershey asked the government to grant him exclusive rights to make the telescope for 30 years, or to give him an annual pension in exchange for making telescopes only for the state. Lippershey's telescope was of great interest to the government because it could provide a vital military advantage against hostile forces. On October 4, 1608, Lippershey was asked to make binoculars for the government. Lippershey seemed certain to receive the patent, but October 17, 1608, brought news that threw both his patent-and his historical legacy-into question. Jacob Metius, an instrument maker from the northern town of Alkmaar, arrived at The Hague with a request to patent his telescope. A few days later a letter arrived from the councilors of Zeeland (the province in which Middelburg was located) saying that yet another man had approached them with a patent application for a telescope. The government of the United Provinces then decided that too many people knew about the telescope and that its design was too easy to replicate to warrant a patent. Lippershey's hopes for a patent were dashed. The question of who really invented the telescope is impossible to answer with the evidence available. Several possible explanations exist for why so many individuals in Holland appear to have invented the telescope at the same time. Legend has it that after building the first telescope, Lippershey put it on display outside his shop so that passersby could look through it; thus the telescope's inventor, be it Lippershey or someone else, may have shown the instrument off and inspired others to copy it. The discovery might also have been made by many independently. High-quality glass for lenses was becoming more widely available at the time, and more than one person might have stumbled upon the telescope effect. In any case, Lippershey returned to Middelburg and began manufacturing binoculars for the government of the United Provinces, completing them in 1609. Lippershey's expertise as a craftsman was evident in his work. Creating two identical telescopes and connecting them so they create a single image for the viewer is difficult; thus, functioning binoculars were rare. Lippershey continued to work in Middelburg until his death there in 1619. The government of the United Provinces had been impressed by the telescope's military possibilities, and the telescope came into use by its military. Because the telescope was easy to make, in a relatively brief period of time it was adopted by most European armies and navies. The telescope would have a truly revolutionary impact on another field, however: astronomy. By the spring of 1609, telescopes were on sale in Paris. That May, an Italian astronomer, Galileo Galilei (1564-1642), heard rumors of the device. Galileo set about building his own telescopes to watch the night sky. The results of his observations were published in March 1610, and they astonished Europe. According to the astronomy of the time, which relied on a combination of religious and classical theory, the planets were perfect spheres and everything in the universe was believed to revolve around the earth. Galileo reported that the earth's moon had craters and mountain ranges just like the earth, and that he had he observed four objects that revolved not around the earth but around the planet Jupiter. Galileo's findings were just the beginning: the telescope helped to transform astronomy into a rigorous observational science. Astronomers, in turn, helped to improve the telescope, first using different types and arrangements of lenses, then combining mirrors with lenses to create telescopes that could see farther and with less distortion. In modern times, astronomers use an impressive array of telescopes that can observe visible light, heat, x-rays, gamma rays, and radio waves.